Pilot 3000 is a sophisticated DMX controller ideal for controlling large and small lighting systems. Pilot 3000 can control up to 1024 DMX channels via two independent DMX outputs. 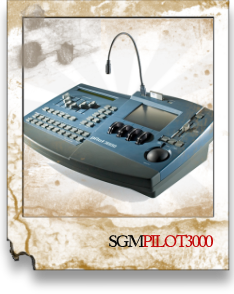 Using the Pilot 3000 is simplified by the logical layout of its controls and the use of sophisticated facilities, including: Colour TFT touch screen for direct access to the functions displayed; 4 encoder wheels for controlling the parameters of the Palettes during editing, programming or for assigning values in the program's various screens; 1” Jog Ball for Pan/Tilt. The on-board software and comprehensive connectors enable major communication protocols (DMX 512, MIDI, SMPTE) to be handled. Pilot 3000 is connected to PCs via a USB port.